South West College’s highly trained staff used state-of-the art equipment, to solve a visualisation problem for McCoy Group construction firm. Offsite construction specialist The McAvoy Group, who are based in N. Ireland, identified the need to further their research into emerging digital technologies and retain their competitive advantage in the marketplace. Virtual Reality (VR) has become a crucial design and showcasing tool for companies across the construction sector and The McAvoy Group were keen to explore further opportunities presented by the advanced use of this immersive media. The McAvoy Group is an independent, family-owned business and an established principal contractor. It has been providing bespoke offsite solutions and interim modular buildings for almost 50 years. Theydeliver fast-track projects of the highest quality and in up to half the time for the health, education, residential, commercial and infrastructure sectors, with less impact on the environment and greater assurance of completion on time and on budget. South West College has been delivering groundbreaking digital technology solutions to industry for many years. This project with McAvoy Group allowed the college’s highly trained staff to use state-of-the art equipment, to solve a visualisation problem for the construction firm. It made use of Virtual Reality as the medium to engage with future clients, immersing them in a 3D virtual world, to allow them to better understand the company’s capabilities in terms of its offsite solutions for their clients. The academic team worked closely with McAvoy’sto develop a Virtual Reality product help improve the client engagement process, and allow for a streamlined process to visualise and understand the design options available. The McAvoy VR Experience is an interactive virtual reality showcase of the new Concordia School buildingthat has now been handed over to their client. It showcases the school’s design, McAvoy’s building process and has interactive engaging/entertaining elements. Virtual Reality is ideal for architectural visualisation, allowing a user to experience an environment in the most engaging way possible. 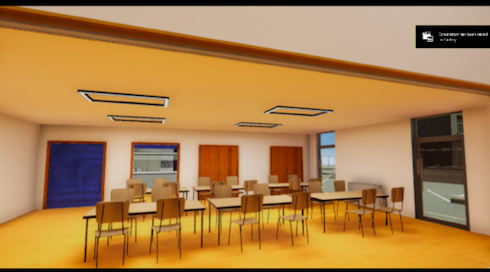 Often, architectural design systems that use virtual reality require user training and do not allow the user to participate in any activities. 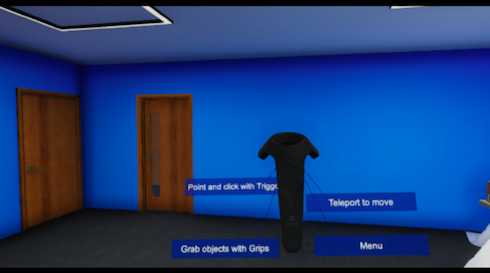 The VR Experience allows an accessible, entertaining virtual environment for users to explore the Concordia school building. It includes several actions for users, such as the ability to view The McAvoy Group’s Build Process, explore scale views of the building and take part in a basketball game. The programme is designed with VR naive users in mind. As such the control scheme is intuitive and simplistic and on-screen prompts are built in to assist interactions. South West College has campuses in Cookstown, Dungannon, Enniskillen and Omagh. The college places great focus on forging strong links with local industry, which often results in an expansion of the curriculum offering, as well as support to the regional and local economy. If you have a business need, training requirement or opportunity you would like to discuss or if you wish to engage with any of SWC’s programmes, please contact Stephen Moss on Stephen.Moss@swc.ac.uk .